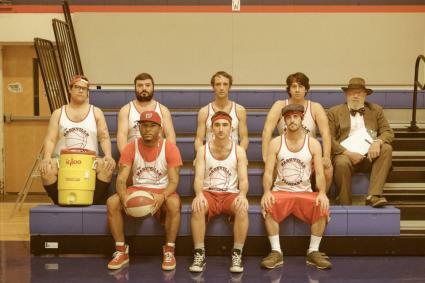 On yesterday's Presidents' Day edition of Steve Gorman Sports!, our very own local basketball team, the Nashville Pioneers, saddled up to the mic to talk about their team goals (aka "The Map Of Imminent Conquest"), giving 115%, and their upcoming games. Hear Adrien Saporiti, Ben Elkins, and Joe Clemons talk shop right around the 15 minute mark here or hit the player below. Fresh off their win in the alleged game against Seoul that we suspect may or may not have actually ever happened, the Nashville Pioneers are holding their post-game pep rally at the Stone Fox for a night of dancing and DJ sets from the likes of Wild Cub, DJ La Force, and Jeremy Todd. Though we introduced you to the team back in December, this your first opportunity to get out and party with the Pioneers, so put on your dancing gear and head down to the Stone Fox. The party starts at 9 pm. Proceeds from the event go to the Oasis Center. For more details about the pep rally, go here.